The special design reels supplied by ADVANTEC include air driven Reels, or electro-hydraulic reels where high forces and precise controls are required. Reels are designed for Ultra Deep-water applications down to 3,000m water depth. Downline Reels for carbon fiber pipes, 2” to 4” pipes. Such pipes require large bending radius, and the Reels are certified to a range from 125 to 165 tons. 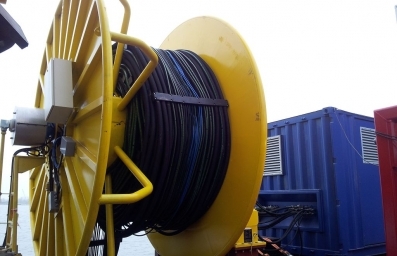 The Downline Reels are used for flushing and drying of subsea flow lines, for operation down to 3,000 water odepth. Special consideration has been placed on critical operational issues including large brake and pull forces, and the equipment is provided with a constant tensioning system to ensure smooth operation. Downline Reels have electro-hydraulic drives and controls, and the operation is through local or remote control panels, with fingertip control through joystick operation. Such large reel systems are certified to DnV 2.7-3 and can be supplied for safe area, or Zone 1 installation according to the ATEX directive. Reels can be supplied with a rotaty (swivel) for hydraulic fluids and electrical, or fiber optical slip rings for power and controls.